Old school text adventures. Set in old schools. Online searches often turn up interesting text adventures, either new or – from more technologically simpler times – historical. Pleasingly, a query in late 2014 revealed some text adventures from a quarter of a century or so ago which were set in academia. From 1988, Dudley Dilemma is set in Harvard University. 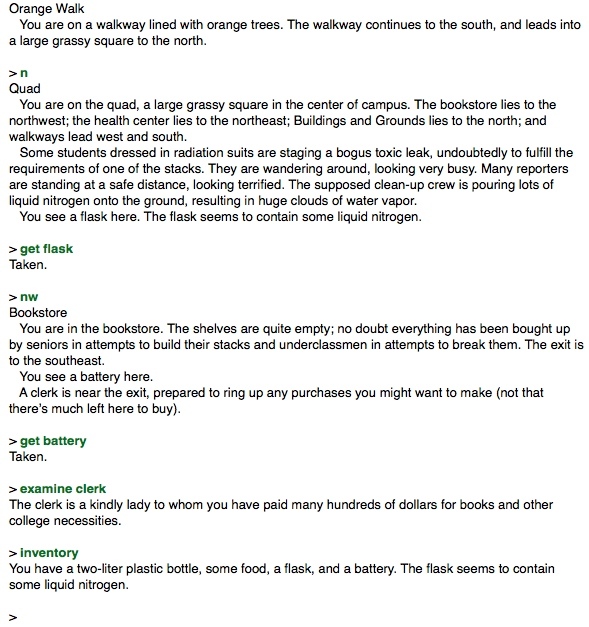 From the screenshots it appears to be a basic and standard text adventure. From even further back in 1987, Infocom themselves released the acclaimed Lurking Horror, which though initially set in a large MIT-like American university, soon veers off into somewhat unsettling horror. Two other text adventures from back in the/that day I’ve been playing of late are Save Princeton and Ditch Day Drifter. Both of these can still be played by using a TADS-compatible interpreter (I’ve been using Splatterlight on my Mac). Both games are quite enjoyable to play and, as you do with text adventures, experiment with to see what the parser recognises, allows and acts on. Author JohnPosted on April 15, 2016 March 5, 2017 Categories Games on academia, Text adventuresTags California Institute of Technology, Caltech, campus, Ditch Day, horror, parody, Princeton, simulation, slapstick, universityLeave a comment on Old school text adventures. Set in old schools.